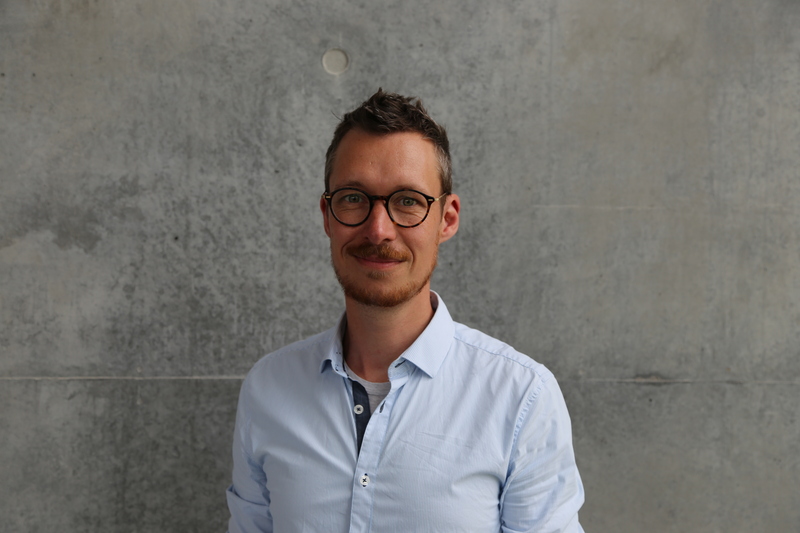 — Written by Library Lab Fellow Michael Svendsen — project head of The Digital Social Science Lab (#DSSLucph) at Faculty Library of Social Sciences, Copenhagen University Library. The last stop and visit of the travelling fellowship of Danish Data Librarians unofficial New York City Tour (read the full story at the Library Lab blogpost of data fellow and library director Christian Lauersen) took us to the downtown part of Manhattan, that houses a huge Campus area of the NY University. 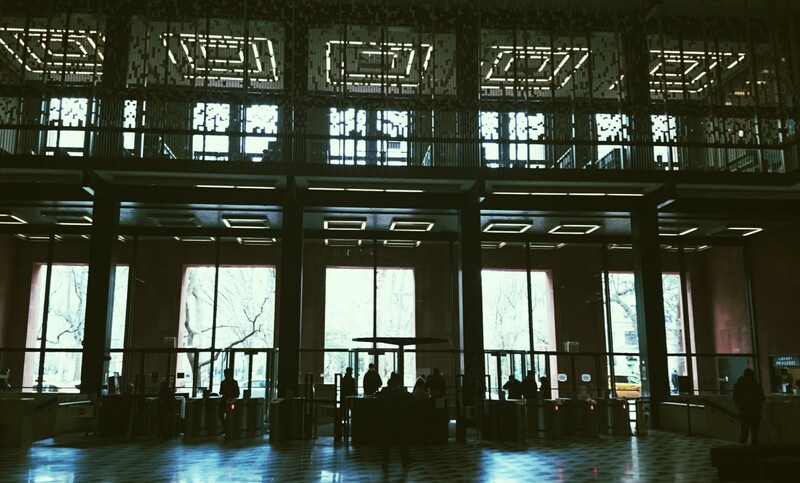 In one of the most spectacular but surely not most beautiful library buildings of New York from the outside - the EH Bobst Library – we got two meetings planned Friday morning to hook up with the academic staff from NYU Data Services via our point of contact Scott Collard, co-cordinator of data services representing the library side of the partnership with NYU IT Services. As an introduction before meeting up with a very much anticipated talk to Scott and the other co-cordinator, Stratos Efstathiadis from IT Services, about the higher level strategic angle in running a data service, we we’re shown around in the physical space, that consisted of a lot of well equipped lab workstations with up-to-date hardware and tailored methodological software for various academic disciplines. What struck me the most and what more and more also is the reality of university students in Denmark bringing their own devices, was the hardware choice and almost only unique support of Mac. We definetely need adjustment to this development as well as our often used mantra in the sector is that “we need to meet our patrons at eye level and where they are” (at a matter of both hardware and software requirements). 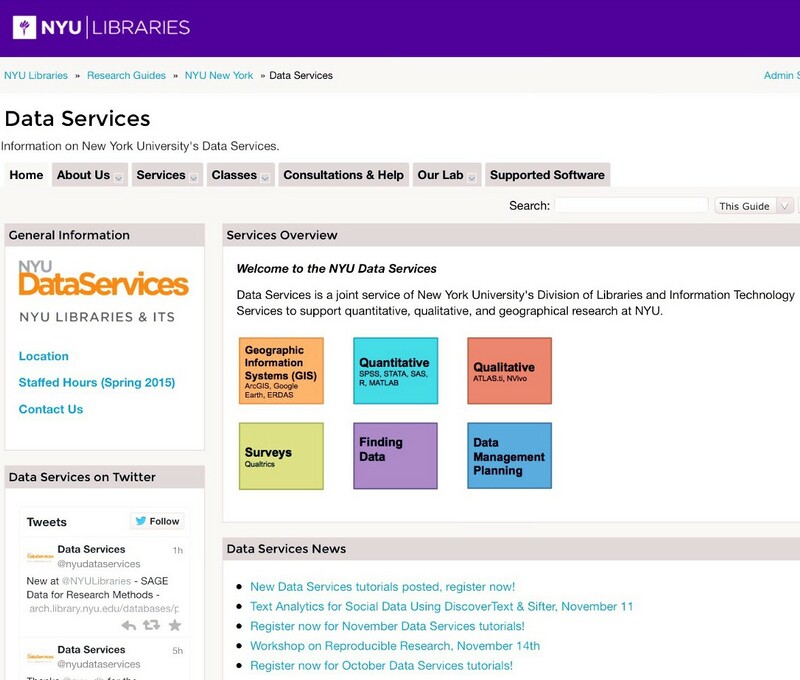 The joint leadership of the NYU Data Service with two coordinators representing both the library and it services has according to Scott Collard been a key take way since the beginning six years ago when IT University staff and University Library staff joined and formed a partnership to get a fully educated staff. Stratos Efstathiadis continues and emphazises that a two-headed staff organization with complementary skills already was a no-go solution in the initial phase and not a recommendation that none of them wishes to pass along to us under our discussion while presenting our own efforts to establishing the three digital Library Labs at the Copenhagen University Libraries of the Social Sciences, Humanities and Science. According to Scott and Stratos the underlying succes of the NYU Data Services rely on a very well organized and skilled staff structure that is often taken up to account and monitored by the whole team as the field of data science is very dynamic and the usage of digital tools evolves continously. 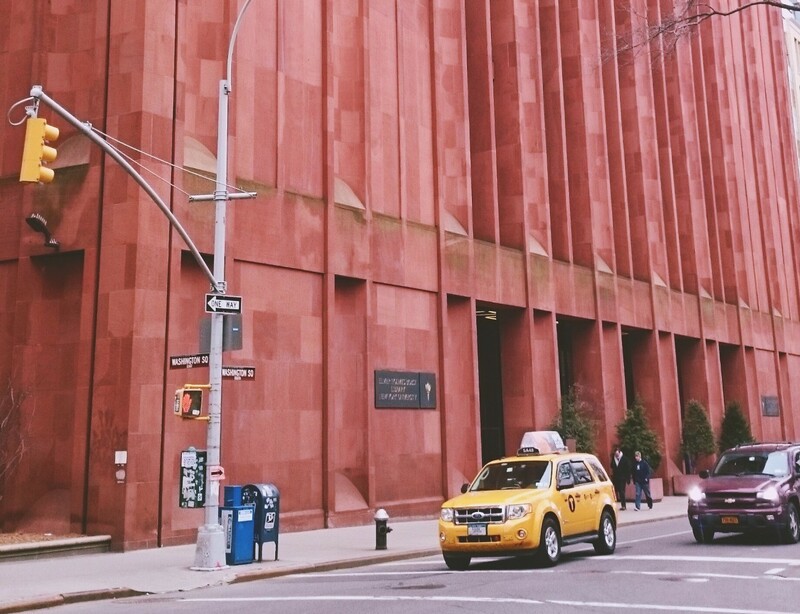 As fx the hiring of a qualified GIS-person was key as the demand for such a service has become very big at NYU. Scott told that there’s basciaclly not a department that doesn’t work GIS software for mapping and visualization of collected data. The first part of the morning session was given a very pleasent amount of time so we got to ask a lot of questions to two very interesting and experienced data aficianados that forms the lucky daily leadership of what to my humble opinion seems to be one of the best developed, skilled and running core data services in universities of the east coast of the US. Luckily, we ran into midterm break during our many NYC Lab visits during the week, otherwise we probably wouldn’t have had the chance of meeting half of the professional 8 staff membership because the Data Services are very very busy during opening hours on regular working days. Together with the coordinators we had a very inspiring hour of exchange of ideas and experiences from the service leads and specialists for the main areas: Andrew Battista (GIS), Denis Rubin (quantitative), Himanshu Mistry(manager) and Katherine Gregory (qualitative & survey design). The extensive portfolio of the teams provided services is published through their great and very detailed libguide on available data services. To select some staff and students who are willing to showcase good data projects as best practices is key to incubating a healthy environment in the start-up phase. Policies about what your services support and to which extent is important. Mantra is: “We don’t do things for you, we teach you how to do them yourself”. Be aware and learn from especially the grad student and Ph.d. level were a lot of nouvelle activities in digital/data literacy takes place. This is the source from which professors hear about it. Organize special events and sessions w. focused themes: e.g. GIS Days and invite key notes and participants across disciplines. Make a shared vision for a data life cycle targeting both grad students and academic staff. For future areas of development take especially notice of: research data management, repository development, curation of data, infrastructure, workflow management, scripting tools such as Python, data-intensive research and connectivity approach to teaching and learning, but mostly important: learn how to focuse in an environment with many stakeholders. ….and one of the lessons learned from this intense hour of ping-pong conversation with the NYU Data Services staff is that it is crucial to get user data and usage statistics from software providers (in particularly proprietary) in order to develop and make evidence-based decisions on aquisition of new and continous support of installed and licensed software. THANKS to the very kind and friendly staff of NYU Data Services we met at a very cold morning, but who gave us a very warm wellcome and interesting talk about one of the best case scenarios for developing the academic research library into a new future ahead with many digital challenges and hopefully a great lot of fun too. 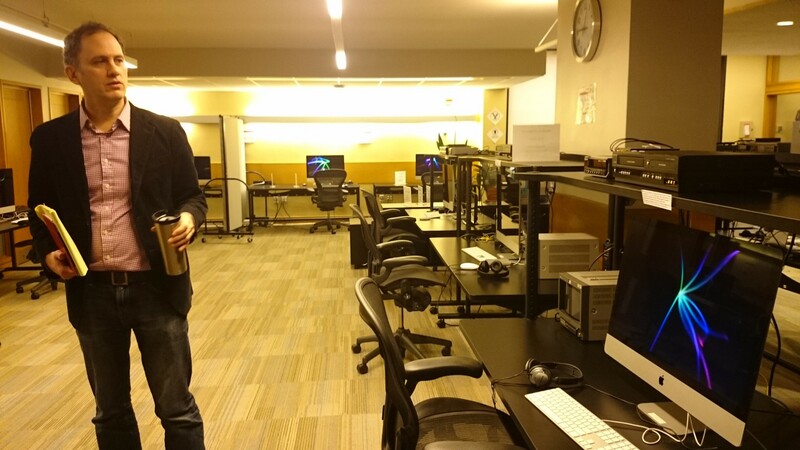 This post is the last in a series consisting of five from the blogpost ‘The Library Lab’ and the final visit of the data librarian fellowship touring NYC and the Labs in the days between March 16 – 20, 2015.